Banks and credit unions face a double whammy. First, consumers are giving substantial trust and loyalty to major tech firms like Amazon and to newer digital banks. Second, this comes as many traditional financial institutions fail to deliver the primary elements of value that consumers crave. Digital players will keep gaining new customers ... unless traditional players up their game in a hurry. Trust and loyalty in banking represent the foundation of current and future financial relationships. However, as large and small technology firms continue to create solutions that are both easier to use and more responsive to customer expectations. this longstanding foundation is beginning to crumble. A Bain & Company global survey says 54% of global respondents trust at least one big tech company more than banks in general, and 29% trust at least one tech company more than their own primary bank. In the U.S., the trust level of tech firms is lower than average (46%) while the trust of tech firms in Italy, China, India and UAE exceeds 75%. (The level is 57% in the UK). If nothing else, these numbers should be a major wake-up call for banks and credit unions that continue to sit on the sidelines instead of embarking on their digital transformation journey. 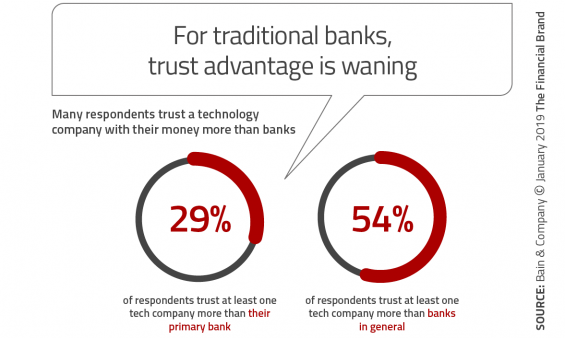 “Trust affects a customer’s willingness to try banking services offered by tech companies,” the report states. “For example, respondents who accord higher trust to Amazon are more open to trying a bank account with the company.” Now, more than ever, financial institutions must improve the components of a banking relationship that consumers value the most, such as quality, convenience, ease of use, low anxiety and stability. 41% would recommend their primary bank to a friend or relative, while 23% would not recommend their primary bank. 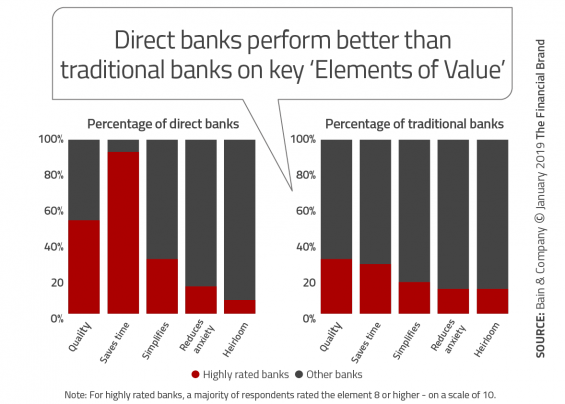 Only 33% of banks were highly rated on quality (the most important element influencing loyalty in banking). 65% use third-party payment solutions for purchases online and at point of sale, with 37% using these solutions for peer-to-peer payments. 65% of Amazon Prime customers open to banking with Amazon if offered 2% cash back on all Amazon.com purchases. The impact of big tech firms continues to grow as they leverage their huge customer bases, analytics capabilities, and revenue models to expand both reach and depth of relationships. Ant Financial, an affiliate of Alibaba in China, is using its core e-commerce business to move into payments, consumer lending, insurance, wealth management, credit scoring and more. Amazon is already making small-business loans, has developed direct payment methods and has developed a prepaid card. Beyond having a treasure trove of consumer data, many of the big tech firms are leaders in creating easy, simple, high-quality digital consumer engagement. The combination of data, advanced analytics and exceptional delivery allow technology firms to increase their impact on the financial services industry on the strength of consumer trust. Bain found that firms such as PayPal and Amazon garner a level of trust with consumers almost as high as banks in general, creating not-so-sleeping giants. If you believe that customer loyalty drives growth and revenue and you agree with the tenets of Bain’s Net Promoter Score (NPS) concept, which measures the likelihood that a consumer would recommend the bank to others, then it is important to understand which components of the score are most important in determining loyalty in banking. Bain has found that in banking, companies that perform well on four or more “Elements of Value” have, on average, more than twice the Net Promoter Score of companies with a high score on just one element, and more than five times the score of companies with no high score on any element. As expected, banks and credit unions that have a strong performance on multiple elements have a greater likelihood of higher and sustained revenue growth, market share growth and consumers’ willingness to pay a premium price, according to Bain. 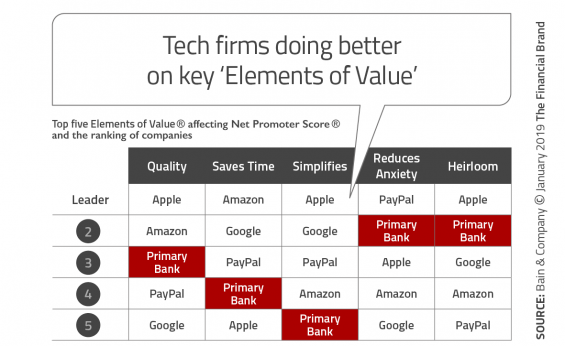 In banking, the five Elements of Value that were found to have the greatest impact on Net Promoter Score were quality (by a wide margin), followed by “saves time”, “reduces anxiety”, “simplifies” and “heirloom” (ongoing stability). Consumers, on average, give their primary bank a lower rating on these elements than at least one of the major tech firms. This should frighten any legacy banking organization as there is continued talk about tech firms expanding their inroads into traditional banking services (either independently or with a co-branded partner). For traditional financial institutions wanting to “catch up” to tech firms, the most impact can be made by focusing on becoming ‘more digital’ (more than a cool app) and by simplifying the entire banking engagement process. This starts with making the product shopping process easy to understand and then continues with a seamless digital account opening process, providing contextual service recommendations (instead of selling) and building loyalty through ongoing collection of insights. For all sizes of organizations, this may require partnering to enable a faster digital transformation. As most of the larger banks have realized, this also may require the development of a digital-only banking unit and will require a complete rethinking of the role of the branch. 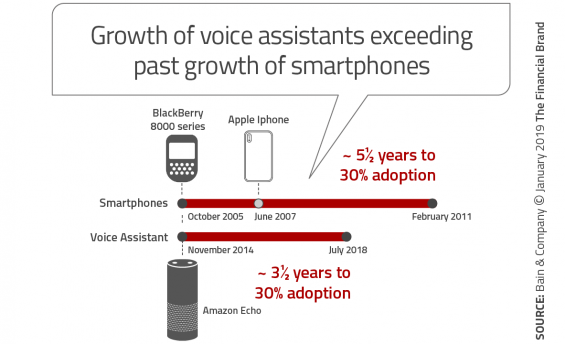 It also requires an analysis of new forms of digital engagement, especially given the rapid rise in acceptance and use of digital assistants. While this may not be the highest priority for many organizations, this movement to voice-first engagement can’t be ignored. As mentioned, the elements that matter most to consumers in retail banking are quality; saves time (convenience), simplicity; reduction of anxiety; and heirloom (stability for the future). The problem for traditional financial institutions is that digital banks and big tech firms are building an increasing gap on being able to deliver on these elements of loyalty. This, in turn, impacts the key financial components of any financial services organization. The numbers are stunning. Bain has found that the growth in revenues for those firms with the lowest loyalty scores have increased by 6%, while those with the highest loyalty scores have increased by 13%. In other words, the value accrued by digital and big tech organizations is directly impacting legacy banking organizations. 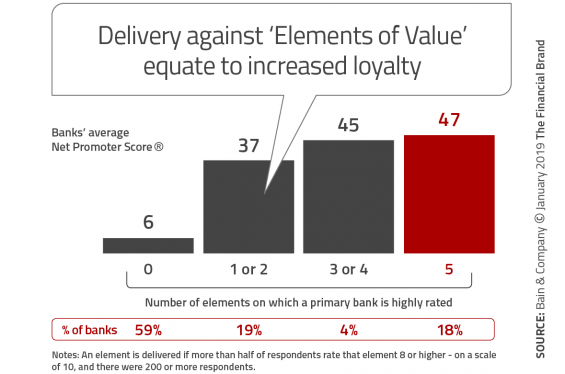 Should Banks Care About the Loyalty Differential? For any bank or credit union, it really doesn’t matter what is happening in another country or even another county if you do not compete in that market. What does matter is how you perform against peers that you consider competition. That said, you can’t ignore the big tech firms like Amazon who all consumers rank high on most trust and loyalty lists. 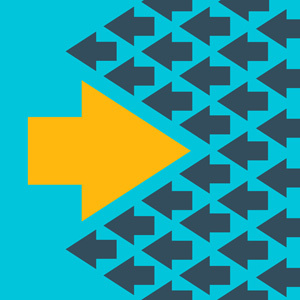 If an organization wants to improve their standing against all primary players, it is best to focus on becoming a much better digital organization and making it easier for digital consumers to do business with you. That may require partnering with specialists or solution providers that excel in these transformations, but the investment is important as the gap in performance between the best and the mass is widening every day.